As a dog breeder, animal health is my top priority. That’s why I enthusiastically recommend NuVet Plus immune system builder to all of my customers. Simply put, it is the best nutritional supplement available today. To assure your puppy gets off to the right start, they have been enjoying NuVet Plus every day as a treat (they love the taste). Continuing this daily regimen is the easiest and best way to keep your pet on the path to perfect health! Hundreds of thousands of dogs and cats are using NuVet to support their immune system and provide optimal health. A strong immune system will protect them from environmental and food toxins such as back yard pesticides, hormones, germs from public places, and even toxic formaldehyde in furniture and carpeting. NuVet Plus will not only protect but also help them maintain a beautiful skin and coat. For puppies - Fills the immunity gap all puppies experience. Shortly after birth maternal antibody effectiveness is greatly reduced. By 8 weeks your puppy’s immune system is at a vulnerable point. Once in their new home, the immune system is weakened by the stress of adoption and exposure to novel bacteria and viruses in their environment. This is also when the vaccine series is started. Vaccines are most effective if the immune system can respond properly. 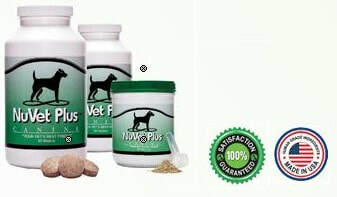 Starting NuVet Plus now is important to helping your puppy grow into a healthy adult. For dogs in their prime - Improves the luster of their skin and coat while providing the necessary antioxidants, amino acids, vitamins, mineral and more to sustain their body’s peak performance during the prime of their lives. For older dogs – Helps provide the nutritional requirements to help them live long, happy, and productive lives in their senior years. ​NuVet is not available in stores, and is only available to the general public with an order code from an authorized pet professional. 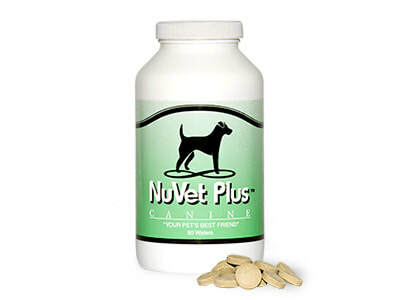 For your convenience, you may order directly from the manufacturer by calling 800-474-7044 and using Order Code: 96676, or ordering online at www.nuvet.com/96676. You can also save an additional 15% and assure you never run out of NuVet by choosing the “AutoShip” option at check out.